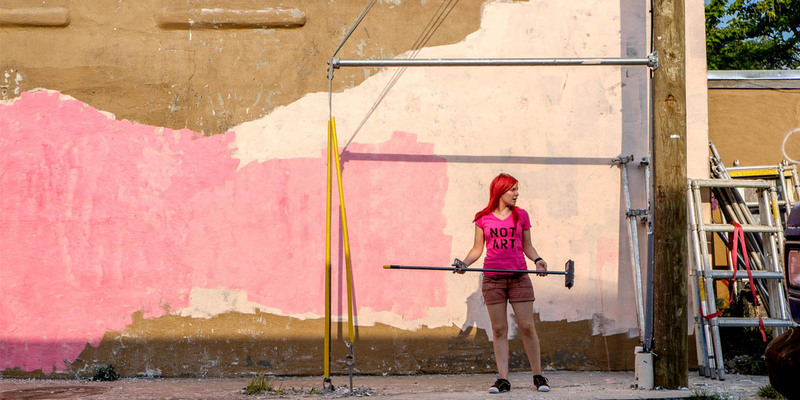 Artist Caroline Caldwell in front of her mural-in-progress on Edgewood and Hilliard Avenue in Atlanta’s Old Fourth Ward during a previous Living Walls festival. Photo by Joshua Gwyn courtesy of Living Walls. We Love BuHi started out as an Instagram account, where founder Marian could capture the stories of people living and working on Buford Highway. Now, it’s a much larger initiative. Through a research project with the Atlanta Regional Commission, Liou is developing a community improvement plan, and one of the recommendations for Buford Highway is to use art and installation to create a safer, more inviting walkways. This year’s Living Walls artists will focus on Buford Highway to create the BuHi Walk, a muraled path that will encourage more walkable routes in the area and give visitors a deeper understanding of the restaurants, businesses and people that live and work in the area. The conference is this week and focuses on topics relating to Buford Highway, urban planning, food and more. There are multiple events open to the public, including a movie night, night market and block party.